Members of Opposition were this afternoon asked to not mislead Parliament with regards to the District Service Improvement Funds and its distribution. This follows a question which asked by the Member for Lae, Loujaya Kouza who questioned why her people have not received DSIP funds from end of 2015 to the first half 2016. Minister for Finance James MARAPE who told the House this afternoon that DSIP funds totaling K1M each was distributed fairly to all 89 districts. 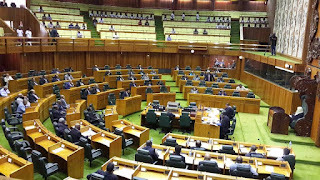 Meanwhile the Member for Lae, was warned by the Speaker of the House, Theo Zurenouc not to make insinuative statements after she began her question with reference to the bible placed in the middle of the chamber. The Deputy Prime Minister and Minister responsible Local Level Government Affairs, Leo DION will be tasked to make a statement with regards to the outstanding payment of Villager/Court councilors. Finance Minister, James MARAPE says FUNDING has been set aside for these leaders at the Village level, but the DPM in his capacity will address the house on when these payments will be made available. This follows questions from the Milne Bay Governor, Titus PHILEMON. The Lands Minister was commended today for trying his best to weed out corruption by Oro Governor, Gary JUFFA in Parliament, who was further concerned about what was the next phase of improving a system which was in place to deal with accurately awarding Land Titles. Further to this, when those who have been implicated, will face the full brunt of the law. Minister for Land, Benny ALLAN, says the SYSTEM is good, but the contractor is currently being investigated before a new one was be appointed to utilize this process of finally awarding Land Titles to responsible land owners. An amount of 40-50M kina was allegedly misused by the previous contractor and the Minister is adamant not to repeat the same mistake.